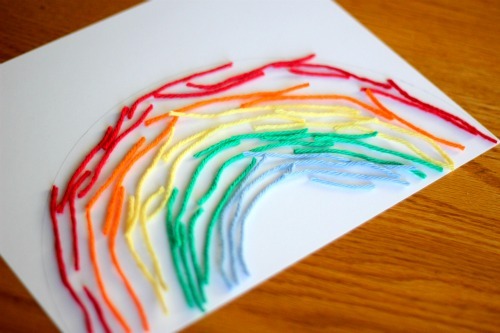 I love rainbow crafts, especially around St. Patrick’s Day. Last week we shared rainbow potato stamping with you, and this week I am excited to share some St. Patrick’s Day yarn art with you using a rainbow theme. We spent last week doing a lot of St. Patrick’s Day activities and one of our favorite ideas involved creating a rainbow spy course with colorful yarn. Afterwards, we had loads of yarn remnants lying around, so we used them to create two yarn art St. Patrick’s Day projects. Snip the yarn into little pieces. Sort the yarn by color. 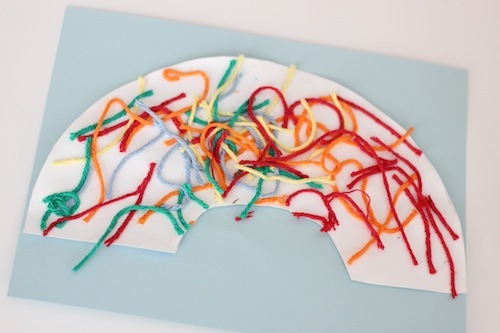 Glue the yarn onto the cardstock in a rainbow formation. You’ll notice that the rainbow at the top of this post (my vision of the rainbow) and my son’s picture below look very different. At first I really wanted to give him more instruction and enforce how he created his rainbow so that the end product would actually look like my rainbow sample. Fortunately, I decided to let him explore the process of creating his own rainbow and the end result was not a “perfect” rainbow in my product-centered opinion, but the project ended with a happy kid who enjoyed his art experience. 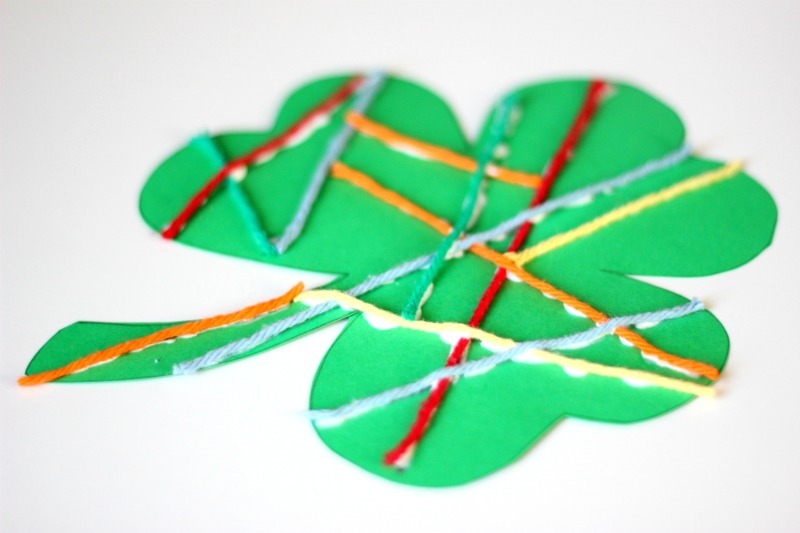 Draw a shamrock or print one off onto cardstock. Snip colored yarn into a variety of sizes. Glue the yarn onto your shamrock. What did we learn? We try to embed a variety of educational concepts into each of our projects. These two projects helped us work on scissors skills, sorting, identifying and labeling the colors of the rainbow, and exploring the process of creating with yarn. Do you have any favorite crafts that your child has created using yarn? Do you believe that creating art with children is about the process or the product?